Lori received her Bachelor of Science degree in Business Marketing with a minor in Business Law in 2012 from Duquesne University in Pittsburgh, Pennsylvania. She obtained her Juris Doctor from Barry University School of Law in 2014. While in law school, she became a Florida Supreme Court County Certified Mediator and mediated a variety of disputes. Lori began her legal career in the corporate sector working for a Fortune 500 company in the area of labor law and tax law. 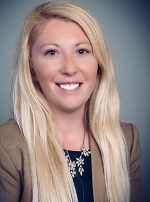 She is licensed to practice law in the state of Florida and currently focuses her practice on workers’ compensation defense. She is a member of the American Bar Association, the Florida Bar Workers’ Compensation Section, and the Young Lawyer’s Division.